The ball is in the back of the Chesterfield net. Tom Nichols (21) has scored the winning goal on his Posh debut. Photo: Joe Dent/theposh.com. Pity new Peterborough United striker Tom Nichols. He scored the winning goal at Chesterfield yesterday (February 6) on his debut and yet it barely warranted a mention in the post-match analysis. It wasn’t much of a goal to be fair. A tap-in from a couple of inches after Erhun Oztumer’s floated corner had defeated home ‘keeper Tommy Lee, under pressure from a handful of Posh players, 10 minutes into the second-half, but it was the catalyst for some extra-ordinary action. The levels of quality didn’t improve (for once it was easy to have sympathy for the players as the strong wind would have tested the technqiue of far superior performers), but the drama went up several notches before Posh claimed one of their more impressive victories of the season. Posh full-back Michael Smith is about to be sent off after receiving his second yellow card from referee David Coote. Photo: Joe Dent/theposh.com. A 1-0 away win at a poor team that had already lost eignt home matches before this one might not seem much to write home about, but the circumstances made the achievement significant as well as noteworthy. Posh were reduced to 10 men by the dismissal of right-back Michael Smith on 59 minutes and to nine men by the sending off of centre-back Ricardo Santos on 78 minutes. 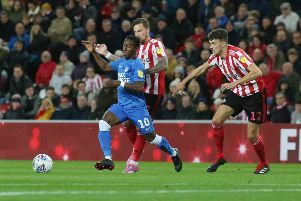 The conditions were already testing enough for a Posh team more renowned for skill than substance, but some gifted young players proved they have the heart for a battle at the Proact Stadium. There won’t be many occasions when Chris Forrester’s defensive ability overshadows his skill on the ball or when Jon Taylor is more effective in his own penalty area rather than the opposition’s, but they were key factors in Posh re-igniting their promotion push after a three-game run without a win. They also survived thanks to some heroic defending led by the irrepressible Michael Bostwick and some excellent organisation which restricted Chesterfield to just two on-target shots in the 20 minutes or so (there were seven added minutes) when they had a two-man advantage. Posh goalkeeper Ben Alnwick saved Dion Donohue’s deflected shot with his legs and Bostwick threw himself into a goal-bound shot from Tom Anderson when the tall central defender looked certain to score, no doubt late substitute Gaby Zakuani, a specialist in Alamo-style defending, smiled in appreciation of his partner’s efforts. As they should with such a huge advantage Chesterfield worked themselves into promising crossing positions, but couldn’t find the killer final ball or cross. Posh substitute Gaby Zakuani salutes his side's fans after the 1-0 win at Chesterfield. Photo: Joe Dent/theposh.com. Posh had started the game without back injury victim Jack Baldwin and Zakuani was only fit enough to play the final 15 minutes. Midfielder Harry Beautyman was given the defensive nod ahead of Zakuani when Smith walked off and played superbly. Posh frustrated Chesterfield so successfully, the players had to survive a volley of abuse from home fans as they left the pitch. Alnwick copped plenty of stick during the game as well for slowing proceedings down by calling for treatment after catching crosses, quite possibly to give his team-mates a breather. It was the act of a professional or a cynical time-waster depending on which side of the fence you were sitting - the presence of Graham Westley in the Posh technical area was enough for virtually everyone in the Chesterfield camp to think the latter. Certainly Spireites boss Danny Wilson did. In typical manager-style he felt both Posh red cards were deserved, yet he criticised referee David Coote for his ‘poor control’ of the match, namely by declining to book Alnwick for his ‘non-stop time-wasting.’ He was also ‘flummoxed’ that a ‘whistle-happy ref’ didn’t disallow the only goal of the game for a foul on Lee and that Posh didn’t cause his team any other problems, which conveniently ignored Lee’s fine save from Shaq Coulthirst, after excellent work from Lee Angol, and Erhun Oztumer’s 20-yard effort that hit the crossbar. Angol was a surprise selection at the tip of the midfield diamond, but he is a strong runner with the ball at his feet. Even with nine men Posh came closest to scoring, albeit rather fortunately as Alnwick’s huge clearance kick out of his hands was carried the length of the field by a powerful wind, forcing Lee to back-pedal furiously before tipping the ball over the bar. If Alnwick had grabbed a goal to add to his irritating antics, the Proact Stadium might well have self-combusted. The first-half had been evenly contested on a bitterly cold day. Chesterfield adopted the now standard League One tactic of pushing right up to stop Posh playing out from the back and that helped the home side dominate the opening 20 minutes, but Alnwick was only called into action once after Bostwick had been caught in possession enabling Lee Novak to drive at goal. Set-pieces were testing, but Alnwick received more help from his defenders than Lee. Santos did well to head one out from under his own crossbar under pressure from an opponent with Alnwick nowhere to be seen. But by the time the first-half ended, Posh were looking the superior side and, after taking the lead, could reasonably have expected to win comfortably as they had the elements in their favour. Circumstances meant the exact opposite was true. What Westley thought about the dramatic conclusion was obvious before he uttered a post-match word. He reacted to the final whistle by throwing both arms in the air before leading his players to a fist-pumping celebration in front of the 700 visiting fans. Westley hailed his players as ‘fantastic’ and offered sympathy to both Smith and Santos, although the former could surely have no complaints about the first red card of a 189-game Football League career (save for an alleged undetected foul which allowed Chesterfield to break and cause the second yellow card). Santos was more harshly treated, but will regret the first of two yellow cards in 15 minutes as it was issued for delaying a Chesterfield re-start deep in their own half - the big central defender’s two red cards have both arrived in matches against Chesterfield. Meanwhile Nichols was left to reflect quietly on his match-winning debut. He’s the third Posh player this season to score on his debut after Angol and Miles Addison. Posh: Ben Alnwick, Michael Smith, Harry Toffolo, Ricardo Santos, Michael Bostwick, Chris Forrester, Jon Taylor, Erhun Oztumer (sub Harry Beautyman, 58 mins), Tom Nichols (sub Gaby Zakuani, 80 mins), Lee Angol (sub Martin Samuelsen, 58 mins), Shaquile Coulthirst. Unused substitutes; Adil Nabi, Dion-Curtis Henry, Souleymane Coulibaly, Andrew Fox. Chesterfield: Tommy Lee, Chris Herd, Sam Hird, Tom Anderson, Dion Donahue, Liam O’Neill, Gary Liddle, Jay O’Shea (sub Aaron Gardner, 85 mins), Lee Novak, Sylvan Ebanks-Blake (sub Rai Simons, 46 mins), Drew Talbot (sub Gboly Ariyibi, 69 mins). Unused substitutes: Aaron Chapman, Ollie Banks, Lawrence Maguire, Conor Dimiao. Goal: Posh - Nichols (55 mins). Sending off: Posh - Smith (second yellow card, foul), Santos (second yellow card, foul). Cautions: Posh - Smith (foul), Forrester (foul), Santos (delaying the re-start), Toffolo (foul). Chesterfield - Herd (dissent), O’ Neill (foul).